On this trip I used the Nikon D700 with an 85mm f/1.4 (which I got hours before leaving, from Penn Camera), 24mm f/1.4, 14-24mm f/2.8, 70-200mm f/2.8 lenses , a Singh-Ray Vari-ND filter, and several B+W filters, including the wide angle circular polarizer. I brought my Gitzo tripod with me, but foolishly I did not use it. I say foolishly, because the night shot of the Puente De La Mujer (Bridge Of The Woman) was sadly not as sharp as it would have been when using a tripod. I left the 70-200mm f/2.8 in the safe at the hotel for the most part and primarily used the 24mm f/1.4 and the 85mm f/1.4. I had the 14-24mm f/2.8 and an SB-900 speedlight in my bag. When it was brighter out at mid day I dropped on a B+W KR6 77mm and the Singh-Ray Vari-ND filter on either the 24mm f/1.4 or the 85mm f/1.4 and made sure to set my white balance to daylight. That allowed me to drop the light coming into the lens so that I could still shoot at f/1.4 in the bright sunlight. Below is an example of one of the shots during this harsh light time. It looks like it was taken during an overcast day, but you can tell by the shadow under the bench that it was taken close to high noon. I really love the ﻿85mm f/1.4. The ability to drop the depth of field so shallow and have the in focus plane be so incredibly sharp is just amazing. As I said, I picked up the lens just before leaving on my trip. The first thing that amazed me was how clear and cavernous 10 elements and 9 groups can be. The lens really looks empty when you look at it from the front. It looks almost as though there is filter and then the aperture blades in the rear. I will have to take a shot of the inside of the lens to show the inside. I can say that the pictures with this lens nothing short of amazing. That brings me to my next note; shoot 1.4. What is the point of using and carrying 1.4 lenses if you shoot at f/5.6 and f/8? I dropped into the old "f/8 and be there" mentality as I instinctively do when I shoot travel photography. I flash back to the days of my old Nikon F5 with a 35-70mm f/2.8 and a 80-200mm f/2.8. Now that we have digital we can shoot a lot more and take more chances. It may be harder to get exacting focus when you shoot f/1.4, but the shots are just outstanding by comparison. On f/8 the shot looks like it was taken with a point and shoot, on f/1.4 it looks like medium format. Just look at the above photo of a very mundane subject and how f/1.4 just pulls it out. It is even better with portraits! This is another example using the B+W KR6 77mm and the Singh-Ray Vari-ND filter at about 2pm in bright sunlight. I did find that it was often good to shoot f/1.4 and at least f/5.6 to ensure the focus is sharp and you get a bit more depth of field when you need it. Bracketing using 1.4, 1.6, 2, 4, 5.6, 8 pretty much covers you, if you have the time of course. On many SLR cameras these setting are just the roll of a knob when you are in aperture priority mode. So, Yes! You can shoot in mid day with harsh light as long as it is even and still make it look like a great colorful overcast day. Using the B+W KR6 77mm and the Singh-Ray Vari-ND filter in tandem is what I use. I think of it as sunglasses for my camera. When you need sunglasses, so does your camera. 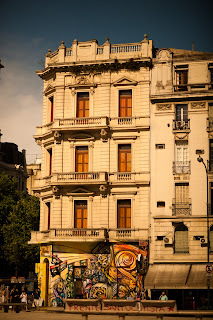 Their are fantastic murals all over the city of Buenos Aires. For most, think of these as very high end grafiti. They are fantastic and are one of the great artistic sights in Buenos Aires. In the example below you can see that this mural is on a wonderful piece of architecture. This mural is shown in detail on vigorotaku.com. For the murals while overcast note and other fantastic murals, check out the pictures on vigorotaku.com in Buenos Aires (under featured or locations) and you will see how some of the murals have harsh shadow due to the angle of the sun. Now we are on to two more notes. Shoot at the right time and use a tripod. The second note is more important. That is USE A TRIPOD! We all know this, but we get lazy or we are in a hurry. Well back to the old "f/8 and be there" days. Had I used a tripod and set the camera on f/8 and ISO 200, I would have had an amazing saleable photograph. Instead, being lazy I shot it on F/1.4 and 6400 and got a nice shot, but not good for anything by a 4x6 inch print, if that. It is muddy and full of grain. Now if I lived in Buenos Aires this would be no problem. I would just go down there on a similar night and shoot it again with a tripod. Well since I was just travelling through, I have to live with this shot. Now on to Carry less, keep moving, get closer. One of our nights in Buenos Aires, my wife and I went to one of the myriad of dinner / Tango shows that are featured. 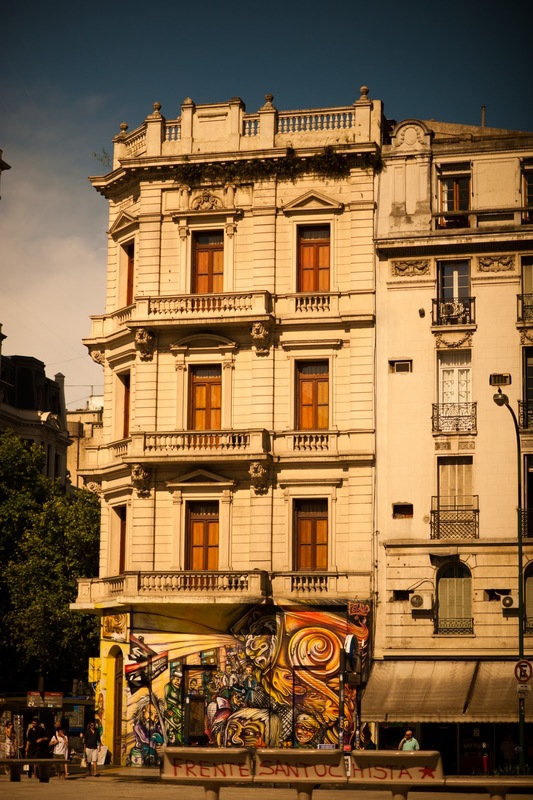 Buenos Aires is known for originating the Tango. My wife and I wanted to get some pictures of the dancers. When I go to dinner with my wife I can't exactly be rolling the old pelican case full of strobes, stands, light modifiers, etc. with me. I also can't whip out anything like a 70-200mm f/2.8 or better yet my 200mm f/2.0. (I got away with using that one in Istanbul on our trip because we were in a dark orchestra pit setting on the aisle. The lighting was extremely low and red. I will have to post about this at a later date.) So what I used was the 85mm f/1.4 and the 24mm f/1.4. If I had to choose one for the night I would take the 85mm f/1.4. So if you are wondering what I would carry if I had only one lens to buy or carry to a dark concert the 85mm f/1.4 would be it. With the Nikon D700 and the 85mm f/1.4 you can get shots of the people on stage in the original lighting and not disturb the performance. (Just make sure to turn of the auto focus assist light which blazes like a flashlight in darkness.) The lighting designer has often taken a lot of time to get the lights just right and those on stage try to hit their marks just right. I like to capture all of this in the shot if I can. The shots I got of tango dancers in motion just turned out wonderfully. Especially if you consider that all I did was turn slightly around in my chair sitting across from my wife and shoot a few shots. This was not a photo shoot type, just several shots at carefully timed instants. Dinner and dancing cannot equal photoshoot if you want to stay married. I have many more notes and thoughts, but I have tried to keep it to a manageable number for a short post. If you would like to see more from Buenos Aires check out Buenos Aires on vigorotaku.com. For those that asked about vignetting with the 24mm f/1.4 and the Singh-Ray Vari-ND filter - there is slight but noticable vignetting if the Vari-ND is the only filter on the lens and the lens is on 1.4. If it is set to 2.0 or so the vignetting is reduced so that it is not noticable. I have used this with video as well on the D4.